This month's Teacher Feature is Mrs. Alicia Henson! Mrs. Henson is the Guidance Counselor at Mount Airy High School. She took a moment to answer some questions for us. Check out what she had to say! What is your educational background? I graduated from North Surry High School then attended Montreat College where I earned my Bachelor of Science in Psychology and Human Services degree. I went on to earn my Masters of Arts in Counseling from Wake Forest University. How many years have you been in education? This is my 7th year in education. How many years have you worked in another career? Before working at Mount Airy High School, I worked for two years as a college admissions counselor. Tells us about your family. 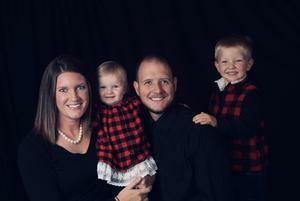 I have an amazing husband, Chris, and two awesome children, Zade (3) and Quinn (1). What is your favorite part of the year and why? Spring is definitely my favorite time of the year. There are so many wonderful things that Spring brings: Easter, warm weather, flowers, my birthday, Mother's Day, celebrating our seniors and the wonderful plans they have made. It always seems to be a time of excitement in both my personal and professional life. Finish this statement: I truly feel called to do this. I want to be whatever my students need me to be, even if that means something different for every student. On a daily basis, I get to be a listener, a liaison, an advocate, a mentor, a sounding board, a brainstormer, an encourager, and much more. My reward is seeing students grow, overcome obstacles, and become compassionate adults with plans to make a difference in the world. Ask your class or group of students to describe you using 3 adjectives. Calm, Helpful, "Straight Up"
How do you view your job? I see my job as very holistic. Academic development, social and emotional well-being, and planning for life after high school are the three major things that I focus on. Each of these things are interconnected, but can look different for each student. On a day-to-day basis, this may mean helping students choose classes for the upcoming semester, leading a group of students through a career assessment, providing personal counseling, assisting students with college or job applications, connecting students to community resources, finding ways to ensure that students' basic needs are being met, exposing students to academic and career opportunities, advocating for students who feel that their voice isn't being heard, and working with parents, teachers, and administrators to ensure that we are setting students up for success. Each day's tasks depends on the needs of my students, and each day looks a little different!